Sandra Shaffer uses the writings of famous men and women (Helen Keller, Beethoven, Winston Churchill...), Bible passages and quotes from quality literature...poems and novels (Robinson Crusoe, The Five Little Peppers and How They Grew, All the World's a Stage...) to teach more than six thousand frequently used words. Tomorrow I'll let them look over their work and then they will turn to a blank page and I will dictate the passage (and punctuation) to them. They will be required to write the passage correctly. I will check their spelling and they will have to write any words they misspelled three times each. Then they will go on to copy the next passage. The next day, I will review the words that gave them trouble the previous day and after giving them a few minutes to study, I will dictate the new passage. We talk about the meaning of each passage as they work. When the Smileys recently received a visit from the favorite uncle, the fond parents had all the five children brought into his presence. First came Billie and little Gertrude, and the uncle was informed that the boy was exactly twice as old as the girl. Then Henrietta arrived, and it was pointed out that the combined ages of herself and Gertrude equaled twice the age of Billie. Then Charlie came running in, and somebody remarked that now the combined ages of the two boys were exactly twice the combined ages of the two girls. The uncle was expressing his astonishment at these coincidences when Janet came in. "Ah! Uncle," she exclaimed, "you have actually arrived on my twenty-first birthday!" To this Mr. Smiley added the final staggerer: "Yes, and now the combined ages of the three girls are exactly equal to twice the combined ages of the two boys." Can you give the age of each child?" See? Lauren will learn to spell coincidences, presence, and astonishment and get a little math in as well. This is fun spelling. So far, Spelling Wisdom appears to have been a wise purchase. The children went wild when the books came in the mail. Claire and Faith grabbed up their spelling book and their dictation notebook that evening on our way to the movies so they could work in the car. Claire even brought her work with her into the theater, "...because this is so INTERESTING, Mom! I might want to work on it in case the movie gets boring. Monsters vs. Aliens held her attention but on the way home the two girls pulled their books out again and got back to work. The day is always his who works in it with serenity and great aims. They can't wait. They've got their books and pencils piled up on the counter ready to go. It's going to be a great day. Eight months later: This post brings more traffic to my blog than any other. I was a fairly new Spelling Wisdom user when I wrote my review. We've covered seventy odd lessons in each of three levels and still are in love with this spelling program. We've done research on artists, scientists and delved into books that we might not have otherwise chosen to read if our curiosity had not been piqued by the passages that the children interact with in their spelling books. I've copied and framed some of the passages to capture the profound thoughts in these pages. (A Swarm of Bees Worth Hiving by Richard Newton is not to be missed.) Spelling Wisdom has been a fantastic choice for our family! Our current approach to spelling is as follows: My two oldest children read their lesson and then I dictate it to them. They write misspelled words three times each. Since they rarely miss a word they move right on to the next lesson. My third child copies her passage one day and I dictate the lesson (including punctuation) to her the next. She writes misspelled words three times each and if she misses more than three words, she repeats the lesson the next day. Again, she is a good speller so this is a rare occurance for her. My fourth child is in second grade. (Spelling Wisdom is not recommended until third grade but she really wanted to be included so we made some accomodations so that she can be successful. If she didn't have so many older siblings, I wouldn't consider this program for her for at least another year.) Anyway, I have her copy a portion of a lesson on the first day. She writes the tricky words for a couple of days and then I dictate that portion when she is confident that she is ready. Again, she copies misspelled words three times each and if she misses a significant amount of words (more than four) I have her repeat the lesson. She works through one complete exercise a week as opposed to the other childrens' two or three. Wow. This does look really great. I'm going to add this to my list for third grade for Sam. Thanks for sharing your find- I had never heard of these books! Hug the kids and tell them I said Hi! Oh! I'm SO with you on hating all the other spelling curricula! We've been through several of the ones you've mentioned, and a couple you didn't. Like you said - all boring. All busy-work for Mom and/or student. I've heard of Spelling Wisdom before, but never had a friend be able to personally recommend it. My big boys are going to Veritas Classical school next year (1-day tutorial) but I'm going to use Spelling Wisdom with M (who'll be 5th grade) for sure! Thanks for the recommendation. What a great idea for learning spelling (and a veritable cornucopia of other information)! I also love the new widget at the bottom of each of your posts. I added it to my blog as well...I can see that I need to put more pictures on my blog! I really had to talk myself through this post: "No, I don't need to get this. Yes, it looks wonderful. Yes, it's how I really think spelling & grammar ought to be learned. Yes, it's too bad it wasn't around earlier. No, we don't need to switch. What I have works for my kids." Then I clicked on your link and looked at the samples and had to give myself the saem talk all over again. It really is great to see all the CM-inspired curricula out there. When I started hs'ing in the early 90's, CM ideas were becoming popular, but it was ALL do-it-yourself. It was hard to stay consistent and I never really could be fully CM, only "ish". I wish I'd heard of this even a few months ago. My 10-y/o loves the structure of a "curriculum" as opposed to Mom's DIY attempts at "informal & relevant" language arts-- this would have really fit the bill for both her & me! (And would be good for my 13-y/o as well.) But, we are into other things now and I daren't frustrate the kids by switching gears AGAIN. Oh well. I'm still keeping it in mind for later. Yes. You are correct in stating that Sequential Spelling is not a curriculum that emphasizes memorizing. I originally chose Sequential Spelling because it does make sense to learn spelling by word families. I still do have Sequential Spelling on my school shelves and if I discover that one of my kids has persistent difficulty with a word family, I may pull it out to hammer home the letter combination that is tripping her up. I did find, however, that Sequential Spelling was not interesting enough to for our family for us to continue to use it as our primary spelling curriculum. Just wondering if you are still pleased with Spelling Wisdom. Are you using it again this year? I thought I'd check back before ordering it for Sam for next year (3rd grade). Miss reading you! TY for this review and update. I just heard about SW and am headed over to SCM to check it out! My DD is in 3rd and a very good speller. We used SWO and SP and I don't care for either. I was hoping to find something like copywork / dictation / etc. to help with spelling and penmanship. Hope this is it! 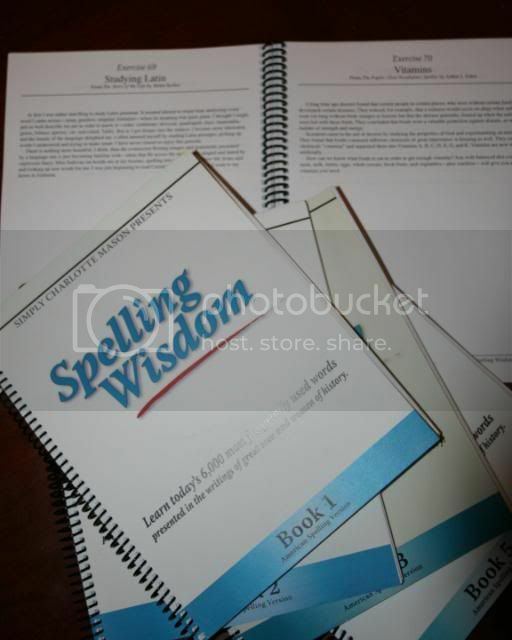 Thank you for posting your review and update on Spelling Wisdom. We used SP last year and my kids did well with it, but SW covers more aspects that spelling and I really like that.